We are most concerned about the non-existent labor standards for contractors, particularly Aramark, the major food distributor on campus and the third largest contract food service provider in the country. Aramark has a history of using scare tactics against its workers when they organize. In 2012, an Aramark Regional Director cut hours and threatened to fire workers who tried to unionize at Western Washington University. Aramark has retaliated against its employees as well when they fired two workers at a Boston convention center for union activity in 2008. In addition to worker intimidation, Aramark has a history of being a bad employer. In fact, workers in Philadelphia filed lawsuits against Aramark for wage theft and alleged the Aramark purposely made pay stubs complex so that workers would not know what they were owed. Although students pay as much as $1,875 per semester for individual meal plans, and hundreds of community members and students work for ARAMARK, UCF administrators do not believe that they are responsible for upholding fair labor standards on campus. 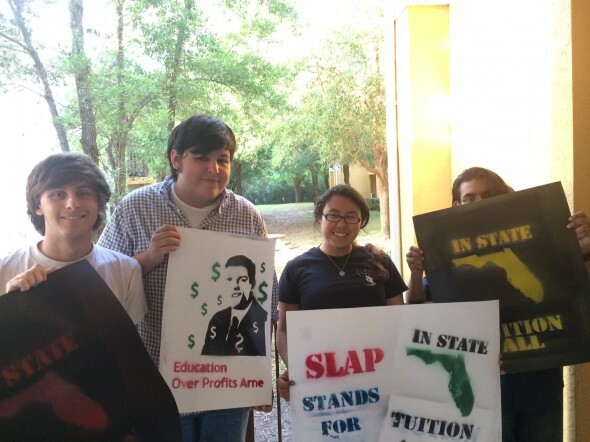 SLAP is organizing students and workers to pressure President Hitt to make campus a better work environment and to bring the student voice into making substantive improvements in UCF’s labor standards. This entry was posted on Friday, April 11th, 2014 at 8:51 pm. It is filed under Blog, Featured, Uncategorized. You can follow any responses to this entry through the RSS 2.0 feed.